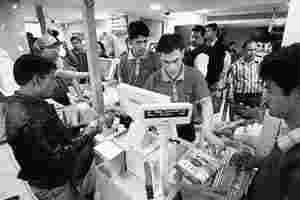 Shuffle in store: Employees at a Reliance Fresh store in Noida. Reliance Retail Ltd, which is axing about 1,000 jobs in Uttar Pradesh after the government asked it to close shops, is now scrambling to redeploy about 400 employees working in the state’s towns adjacent to New Delhi, because it ignored the directive for its Noida and Ghaziabad stores which were larger revenue earners. The two towns are also within easy driving distance of Delhi and are considered part of the National Capital Region (NCR). A senior Reliance official, who did not wish to be named, said the company is planning to shift some employees working in the NCR part of Uttar Pradesh to nearby New Delhi and Gurgaon. Another top Reliance Retail official, who also asked not to be named, said Uttar Pradesh officials informed the company a few days ago that the state’s August directive asking Reliance to close all its stores in the state was very much applicable for the three cities of Noida, Greater Noida and Ghaziabad that fall in the NCR. “What do we do with the people if we don’t have stores there?" the official asked. Last month, citing that the stores could pose law and order problems for the state, chief minister Mayawati decreed that Reliance Retail close all its stores in the state pending a state study to determine the impact of the company’s stores on small and unorganized businesses. Reliance had kept its 15 stores in Noida, Greater Noida and Ghaziabad open for a month despite the directive to close all stores in the state.